Game Preview: @OHLBarrieColts vs @OHLBulls Game 1. #OHL #Playoffs (with GIF) - Very Barrie Colts | A website covering the Barrie Colts of the OHL. Tonight is Game 1 of the Barrie Colts vs Belleville Bulls match-up. These teams met two times in the regular season where the Colts would win both games. In those games, the Colts outscored the Bulls 15-4 and out shot them 73 to 52. Barrie also went 9 for 16 on the power play. I am sure as a Colts fan this excites you, right? Well, it is playoffs that the previous meetings in the regular season have little meaning. Sure we could discuss how neither team finished the regular season looking that hot. Colts may have picked up the pace a little towards the end but in the final 10 games of the season they went 4-5-0-1 compared to Bulls 3-6-0-1. Both teams won games they needed to but neither finished as strong as they would have liked to, but that doesn't matter. We could talk about how the Colts finished the season a +51 (278 goals for;227 goals against) compared to the Bulls -43 (203 goals for;246 goals against) but that is erased for playoffs. 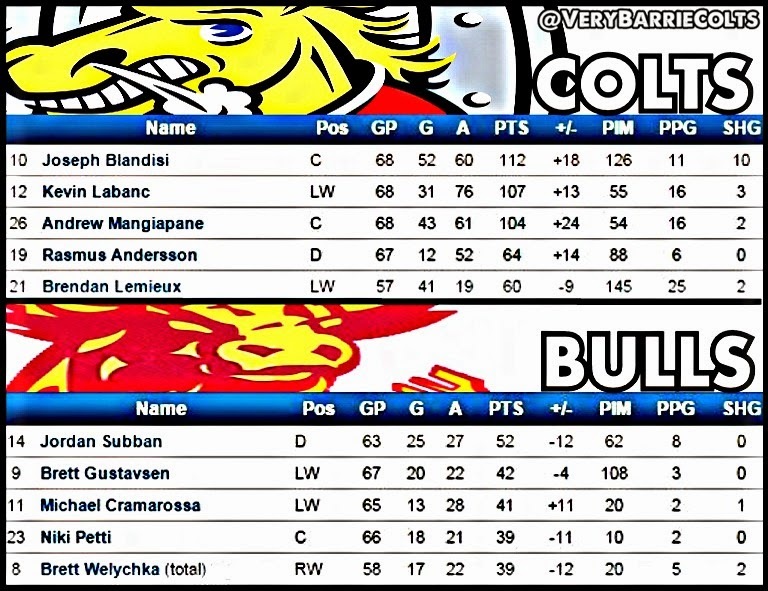 We could mention that there were 3 Barrie Colts who scored over 100 points this year (Blandisi 112, Labanc 107 and Mangiapane 104) compared to the top two point scorers on Belleville not cracking 100 points combined but as of tonight everyone has 0 points. End of the day, this is a new day. We could paint a picture saying that Barrie has been the better team this season but that doesn't matter. This is playoff hockey. Upsets happen. And would it be an upset? Keys to success: Play disciplined. Make simple plays and make sure to be smart with the puck when exiting your zone. Blackwood has been great for the Colts so doing everything possible to make his job easier is important. That means no stupid penalties, no blind/cute passes and work the boards. Barrie might look like the more skilled team but they need to make it as difficult on Belleville as they can. Players to watch: I think Jonny Laser will be huge for the Colts in this years playoffs. Look for him to play a smart game and I think his coolness with the puck will rub off on the rest of the team. Puck drop is set for 7:30 at BMC. Remember, friends. It is playoffs! Let the team know you are there. Yell, scream and support your guys!